Fingers are weird. Have you ever really looked at them? Take a look at your fingers right now. Go ahead. They’re probably normal human fingers—ordinary in most ways. Are they the fingers of wicked witch? Are they the fingers of a villainous vampire? Well, why not? It’s getting closer and closer to Halloween. Don’t you want your fingers to look like those of a hideous creature of horror? Well, don’t worry. 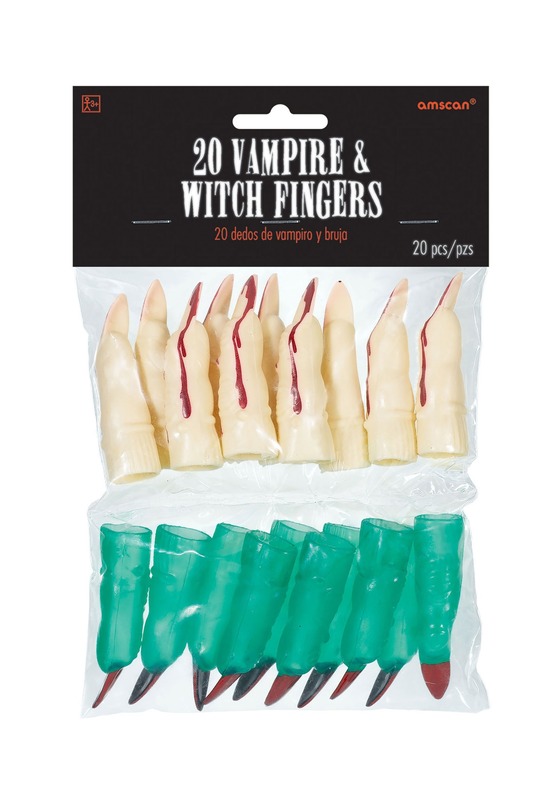 We have you covered with this set of 20 vampire and witch fingers, which will turn your fingers into those of a witch or vampire! These fingers are made out of molded vinyl and are shaped like monstrous fingers. There are a set of white fingers that have a long claw on the ends and painted blood along the side. The other set of fingers are green with a red nail on the tip. You can place them over your fingers with ease since they have a hollowed out inside. Whether you use these to complete your vampire or witch costume, or you decide to hand them out as party favors at your next costume party, these fingers are a great addition to your Halloween season.